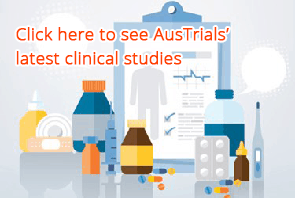 AusTrials is a leading operator of private clinical trial facilities. AusTrials works together with research organisations and pharmaceutical companies to make clinical trials available to patients in Australia. The companies we work with are some of the largest and most respected organizations in the industry and we are proud to be able to provide our volunteers with access to their trial opportunities. AusTrials study centres are operated by an experienced team of medical officers and study coordinators. We value the importance of our study volunteers in making clinical research possible, are committed to providing eligible volunteers access to ethically approved research, and maintain the safety and integrity of the research environment to the highest standards. We have a national network of research sites in which we conduct interventional and observational research. Want to know more? An AusTrials representative will be happy to answer your questions. Contact us here.